Microsoft has published its latest set of quarterly financials. This set is called the FY18 Q3 earnings release, for accounting purposes. Headline figures include revenue of $26.8 billion and net income of $7.4 billion. That revenue figure is an impressive 16 per cent improvement year on year, and net income growth eclipses that news as it went up 35 per cent. As is often the case, Microsoft CEO Satya Nadella made a statement about cloud business progress. 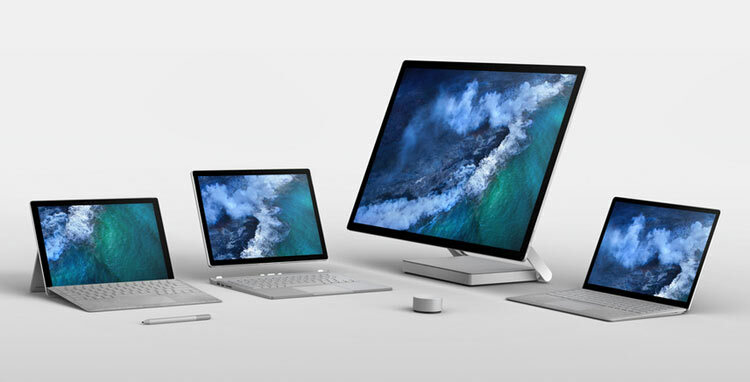 Cloud was indeed a key growth driver but it is notable that Office products, gaming revenue and Surface device revenue were also considerable contributors to the bottom line. Behind the double-digit revenue and operating income growth was a 58 per cent growth in Microsoft’s commercial cloud revenue, revealed CFO Amy Hood. Microsoft’s cloud business spans all three of its business segments (Productivity and Business Processes, Intelligent Cloud, and More Personal Computing - as outlined in the grpahic above) and cloud services positively contributed to them all. Productivity and Business Processes contributed $9.0 billion in revenue, up 17 per cent and includes the following key services; Office commercial, Office consumer, LinkedIn, and Dynamics. All of those product categories enjoyed double digit increases in revenue in the most recent quarter. Perhaps the biggest surprise out of these was LinkedIn, with revenues up 37 per cent, thanks to acceleration in user engagement. The Intelligent Cloud segment revenue was $7.9 billion, having increased 17 per cent. 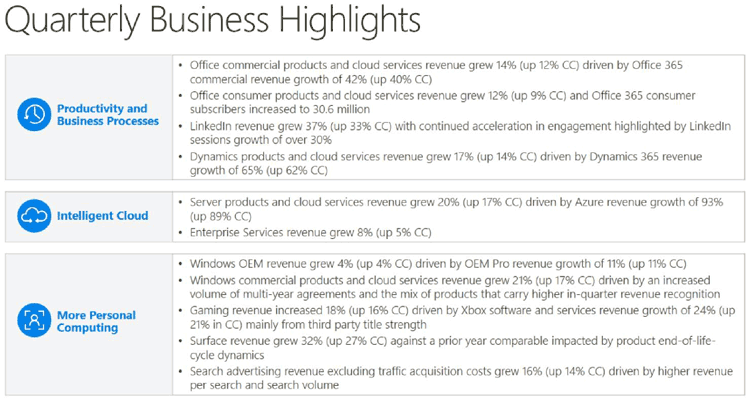 Both Server products and cloud services, and Enterprise Services revenue contributed to the growth. 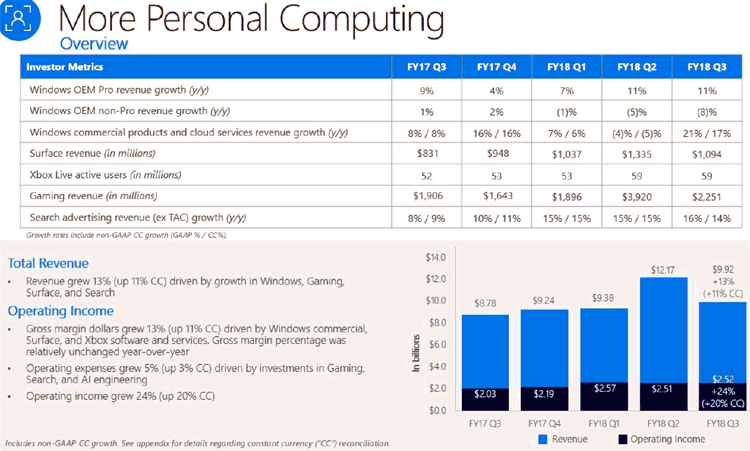 More Personal Computing was the biggest contributor to Microsoft’s revenue earning $9.9 billion and up 13 per cent. This segment is most visible and important to PC / Tech enthusiasts as it includes Windows, Surface devices, and gaming – as well as consumer cloud services and search advertising revenue. As mentioned in the intro, the Surface devices enjoyed an excellent quarter. Microsoft stated that “Surface revenue increased 32 per cent against a prior year comparable impacted by product end-of-life-cycle dynamics”. What this infers is that a year ago the new Surface Laptop and Pro were yet to launch and devices on offer were retail stale. Microsoft gaming did rather well too. Revenue from gaming was up 18 per cent year on year. Xbox software, especially third party tiles, and services revenue growth were the drivers for this improvement.